California Syrah has seen an incremental rise in the quality over the last five years, and this delicious, infinitely pleasing variety continues to improve dramatically. Everyone from revered critics like Robert Parker Jr. and the gang of critics at Wine Spectator magazine to Pinot Noir producers is singing praises about Syrah. So why are so many Central Coast Rhone wine producers lamenting that they're second-hand rose compared to the wildly popular Pinot Noir? IN THE VINES : Steve Beckman (left) and Kerry Damskey of Palmeri (right) celebrated the recent Syrah Symposium at Beckmens Purisima Mountain Vineyard. # While attending the inaugural Syrah Symposium (May 1 and 2) in Santa Ynez Valley-created to educate sommeliers, restaurateurs, and retailers about this interesting red wine-I continually heard references to Sideways. I don't blame vintners for being envious that film's impact on boosting Pinot Noir sales impressed us all. Even Hitching Post chef Frank Ostini, who appeared in the Oscar-winning movie, told me he never imagined the impact it would have on American consumers. In fact, his Buellton steakhouse became so busy he boasted: "Every night is Saturday night now." In hindsight, I can't help asking why we found it so difficult to imagine. Americans love Hollywood, epic movies, and flashy movie stars-and Pinot Noir unquestionably achieved stardom in Sideways. I say it was about time-it wasn't that long ago when Pinot was passed over for Cabernet Sauvignon and Chardonnay. The people behind this new event realized that the best way to boost interest in Syrah is to educate the public. They'll offer an expanded version of the educational series to consumers in spring 2008. The kick-off had much in common with the annual Hospice du Rhone, originally created as the Viognier Guild by Paso Robles vintner Mat Garretson. Although he wasn't a winemaker then, Garretson dedicated himself to promoting Viognier, which was a relatively unknown white Rhone wine in America despite its quality. But that was in 1993 when few Americans were familiar with white or red Rhone varieties. Recent reports from Santa Barbara County Rhone producers show Viognier sales noticeably increasing over the last three years. Clearly these educational seminars and tastings have an impact on consumers. The first symposium featured five wineries: Beckmen, Bridlewood, Fess Parker, Palmeri, and Zaca Mesa, all respected producers of good quality Syrahs and Syrah blends. The winemakers were joined by Master Sommelier Peter Neptune, vice president of corporate training and wine education for the Henry Wine Group. As moderator, he lectured on the long history of this varietal, noting that U.C. Davis in 2001 concluded that modern Syrah originated in the Northern Rhone Valley, a cross of the Dureza and Mondeuse Blanche grape varieties. In the 1970s a group of vintners, including Joseph Phelps in Napa and Bonny Doon in Santa Cruz who humorously referred to themselves as the Rhone Rangers were among the first to plant Syrah in the United States. Neptune led the winemakers through several interesting discussions. During one panel discussion before dinner, he asked the winemakers: "Can Syrah eclipse Pinot Noir as America's top red wine?" Naturally they said it could, and I agreed with winemaker Steve Beckmen's assessment that as California Syrah becomes more refined and expressive of origin it will become more popular, which is exactly how California Pinot Noir became prominent. The inaugural symposium was tested on members of the hospitality industry and the media, an audience of about 40 by my count, in different venues throughout Santa Ynez Valley. A terrific Santa Maria-style barbecue took place at the very cool Santa Ynez Valley Historical Museum and Carriage House. I've been studying the wine business since 1987 and even I learned new things during these tastings, which is why I love discovering new wines and new brands. Most of the time, however, was spent getting to know the participating wineries. Every aspect of this symposium was enlightening and thoroughly enjoyable. I was particularly impressed by winemaker Steve Beckmen's detailed focus on biodynamic farming at his Purisima Mountain Vineyard. He discussed his family's respect for the land as a fundamental element in their business practices, yet candidly admitted being somewhat skeptical about holistic theories at first. Beckmen recalled: "I started biodynamic farming in 1995 after visiting a college friend who farmed and discovering the quality of his vegetables was impressive. He talked of the cosmos and calendar and I wondered how to do it on 150 acres of vineyards." That was the beginning of Beckmen's grand experiment. Next he met Frenchman Philippe Armenier of Domaine Marcoux at Hospice du Rhone in '99 and was further inspired. Armenier is renowned for teaching winemakers the biodynamic theories of Austrian philosopher Rudolf Steiner (1861-1925), who set the guidelines according to the seasons and the zodiac. Currently living in Santa Rosa, Armenier advises 20 California wineries, including Beckmen. In 2006, the 365-acre Purisima Vineyard became 100 percent biodynamic. Beckmen grinned unabashedly while explaining the burial of manure-filled cow horns and making nettle and horsetail teas to compost his soils. "The key is flavor and quality in the wine to express terroir. The sense of place is pretty specific on this property," Beckmen declared while we tasted barrel samples that obviously improved with each new vintage. Zaca Mesa winemaker Clay Brock explained that he first "fell in love" with Syrah when he began making the IO (eye-oh) brand at Byron in Santa Maria Valley in 1993. "I'm in Disneyland at Zaca Mesa," quipped Brock, who admitted he's weary of hearing Syrah continually compared to Pinot Noir. "If we get up in the morning to do our jobs and continue to make better Syrah, it'll become more popular. I like the varietal, I like drinking it, I like making it. We don't have to worry about Syrah becoming the next Pinot Noir." Brock related Zaca Mesa's rich history and reported that it was the first Santa Barbara County winery to plant Syrah in 1979 with cuttings from Eberle Winery in Paso Robles. Notably, Gary Eberle was the first Central Coast vintner to plant Syrah, which he said originated from Chapoutier in Hermitage, France. Eberle later replaced those vines, leaving Zaca Mesa's vineyard the source of the oldest Syrah vineyard in Santa Barbara and San Luis Obispo counties. Another big surprise in the educational booklet provided by the symposium planners: In 2005, San Luis Obispo had 2,571 acres of Syrah, impressively beating Santa Barbara County's 1,288 acres by nearly double. 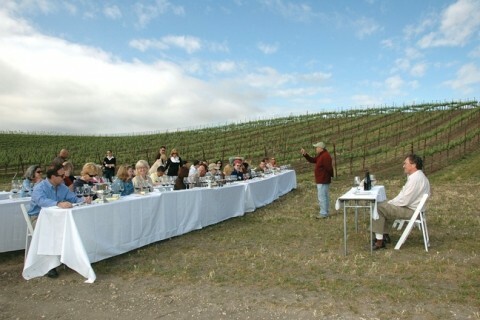 You'll find details about the Syrah Symposium and can sign up for future events at www.syrahsymposium.com. During the final dinner I couldn't resist pointing out to the Rhone wine producers at my table: If Rex Pickett (author of Sideways) had loved Syrah, it would've captured the leading role on America's dinner tables. Let's just say I wasn't alone in that way of thinking. You can contact New Time's Cuisine columnist at Kathy @GrapevineRadio.net.